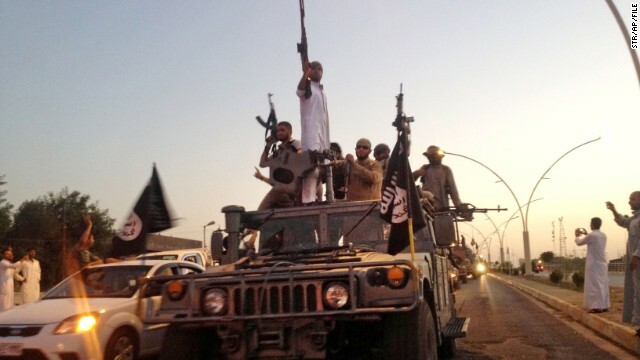 Round 2: The United States hits new ISIS positions near Baghdad, Iraq. The U.S. opens a new front against ISIS. Minnesota Vikings star Adrian Peterson can play this week despite a child abuse charge. And the U2-Apple promotion earns a #fail. New targets: The U.S. opened a new phase in the fight against ISIS yesterday, bombing positions near Baghdad. The airstrike southwest of the city appears to be the closest the U.S. airstrikes have come to the capital of Iraq since the start of the campaign against ISIS, a senior U.S. military official told CNN. And U.S. Central Command said in a statement that it was the first strike as part of "expanded efforts" to help Iraqi forces on the offensive against ISIS. Ebola and ISIS tour: President Barack Obama leaves today on a two-day U.S. road trip to assess and amplify the administration's response to two unconnected overseas emergencies: the Ebola outbreak in Africa and Islamic terrorists in Iraq and Syria. Obama will be in Atlanta at the Centers for Disease Control and Prevention later today to announce significant new U.S. efforts to combat the Ebola epidemic, which has moved quickly across western Africa. The plan includes new military assistance to the region and an increase in trained medical professionals sent to help. Tomorrow, Obama heads to Tampa, Florida, to assess his mission against ISIS at U.S. Central Command. The issue of abuse: Minnesota Vikings star Adrian Peterson said yesterday that he is "not a perfect parent, but I am, without a doubt, not a child abuser." Peterson, one of the NFL's marquee players, will practice this week and can play in Sunday's game against the New Orleans Saints, despite facing a child abuse charge, team officials said. Separately, NFL Commissioner Roger Goodell will work with four women "on the development and implementation of the league's policies, resources and outreach on issues of domestic violence and sexual assault," according to a memo Goodell sent to the league's teams yesterday. Claims come in: The attorney overseeing a compensation fund for victims of GM cars has so far linked 19 deaths to a serious flaw in the automaker's ignition switches. The fund has received 125 claims for deaths and 320 for injuries in the five weeks he has been up and running. GM engineers first knew of the ignition switch flaw a decade ago, but the company publicly acknowledged it for the first time in February. It has now recalled 2.6 million cars related to the problem. Drivers of certain small Chevrolet, Pontiac and Saturn cars can inadvertently bump the ignition switch out of run, disabling the power steering, anti-lock braking and airbags. iGoofed: Apple learned an important lesson this week: Not everyone likes U2. And even those who do really don't like it when you put music in their libraries without asking. A week after giving away a U2 album to most iTunes users, Apple has announced a way for customers to get rid of it. The company released instructions on how to delete the album from an iCloud account, complete with a giant "Remove Album" button. - Guaranteed to blow your mind: This takes some guts and serious musical chops. Panic! At The Disco tackles Queen's "Bohemian Rhapsody" - live. - Cat house: A man with Asperger's builds a feline fun house. It's purr-fect! - Not batty about music: Apparently, winged rodents don't appreciate the arts. - Huh? Miss America’s red cup talent routine from Sunday night still has us baffled. - Franken-song: This is what you get when you put bits and pieces of 23 unrelated songs in a blender. Not bad, not bad at all. What an intricate and unique cat fun house. Go on with your bad selves Panic! At the Disco. Miss America's red cup talent routine? No comment.